Is your toddler's food safe? 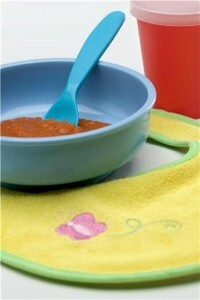 Home » Kids » Is your toddler’s food safe? Is your toddler’s food safe? Childhood obesity is becoming a growing concern, and some parents are taking extra steps to ensure that their children are eating a healthy diet. But what about eating safely? Is your toddler consuming foods that might actually endanger his life? It's a well-known fact of parenthood that small objects have the potential to get lodged in children's throats. When feeding your toddler, be sure that all food is finely diced, sliced or shredded, and that anything non-edible has been removed. Cooked vegetables should be chopped into small pieces that will be easy for your little one to swallow, and meats can be pulled apart with your fingers before being served in order to be easier to chew. Toddlers should never be given small, hard candies, like gumballs or jawbreakers, as these are choking hazards. It's also best for dads to avoid giving their kids anything too sticky or thick, like taffy, which can be tough to swallow. When it comes to making sure your kids are eating right, the best thing you can do is sit down with them – which means more family meal time. Forget about dinner in front of the television. Make an effort to be home at dinnertime so you can teach your toddler healthy, safe eating habits not just by preaching, but by example.